Popularly known as the “man of the masses” as was accorded to then President Magsaysay, the late DILG Secretary Jesse Robredo was to the sector, a well loved “kasangga” and champion. Mindful of his 2 blind kins, he tried to be present in as many gatherings as he could, rooting for “disability inclusive governance and participation” nationwide, such as in national/local elections. 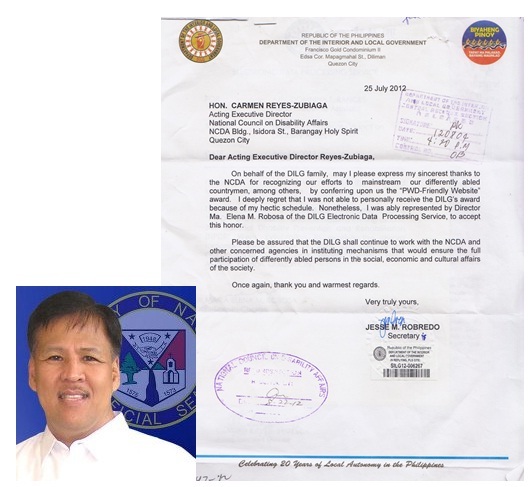 On Wednesday, August 29, 2012, the Council was touched after receiving his heartwarming letter, days after his interment in his hometown, thanking NCDA for conferring the DILG’s ‘PWD-friendly Website Award”, during the 34th NDPR Week. His message, marked by his legacy as a dedicated public servant, posted here as follows, has no doubt lifted many sagging spirits among many Council staff, brought about by the recent calamities and day-to-day concerns. From NCDA Officers and staff, mabuhay po kayo mahal naming Kalihim Jesse Robredo!